The Place As much as Tanjong Pagar is changing with the new Tanjong Pagar Centre, Icon Village is one of the very first mixed development in this area with a concentrated dining options. Opened about three months ago in Icon Village is Maru Dine & Bar, a contemporary fusion restaurant which combines the elements of Vietnamese, Japanese and American cuisine into its dining concept. My first impression of the dining space is the long counter bar and high ceiling, which create a spacious feel. The steel telegraph poles with loudspeakers are reflective of the streets on the Old Quarters district in Hanoi, which is also part of the logo of the restaurant. The dining ambience is casual and relaxed, with a semi-private dining area towards one end of the restaurant. The Food To cater to the CBD crowd, there is a separate lunch menu where the dishes are priced more competitively than dinner. 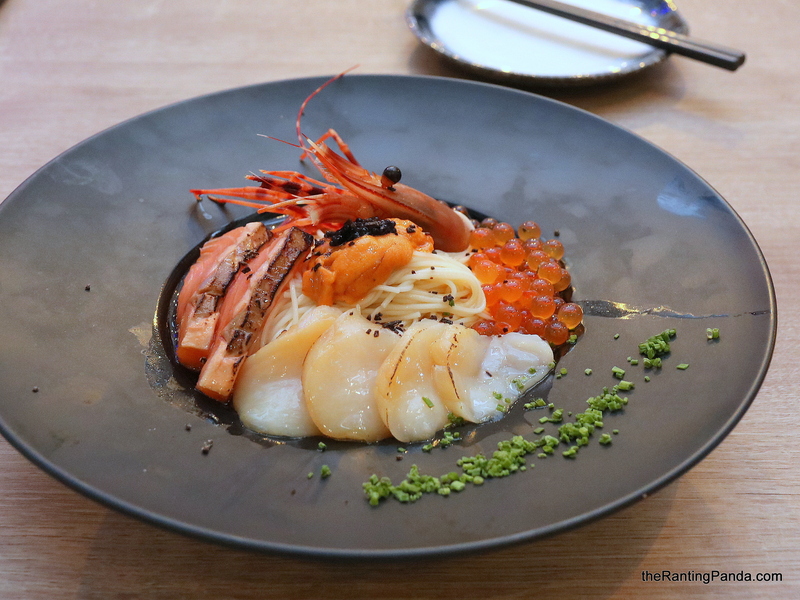 From the lunch menu, I enjoyed both the Sashimi Hiyashi Somen (S$32) and Mentaiko Cod Fish (S$22). If you love fresh sashimi, the Sashimi Hiyashi Somen will not disappoint with a fresh mix of salmon and even uni sashimi. Somen is quite light for me, so this should be easy to handle even if it means heading back to work desk after lunch. The Mentaiko Cod Fish is quite a good portion as well. Glazed generously with mentaiko and cheese and served with fried rice, it also comes with onsen egg! All lunch orders include complimentary salad and there is an option to add a S$2.50 top-up for a Coffee, Tea or Soft Drink. From its dinner menu, the Truffle Chawanmushi (S$8 for Small, S$14 for Large) we had is the small version and comes in 2 small egg shells. The chawanmushi has a smooth and soft texture, while the truffle flavour is not too overpowering. The White Tuna Tataki (S$22 for Small, S$32 for Large) is easily one of my favourite dishes. The whole combination of Nori Wasabi, Orange Ponzu Jelly, Promegranete, Basil, Shio Kosho work wonders and the flavours are so refreshing yet delicious. One of the seafood dish I tried was the Steamed Spicy Asari (S$15/small) prepared the Vietnamese style with lemon grass and coconut milk. This dish is relatively spicy though it goes really well with the thinly sliced baguette (additional S$2), which is like having bread with curry. For something light, the Kale (S$15) salad is a refreshing option. The dressing here is plum sauce, where the salad is also mixed with bits of mint, basil and walnuts to add some crunch to the texture. Kale is one of the most popular superfood in the past few years. For meats, the Duck Breast (S$27) I had is glazed with rice vinegar and grape sauce, quite a unique sauce I have come across. The duck breast is first slow cooked then pan seared, though the texture was a tad too tough for me. The overall flavour is the meat with the sauce also leaned towards the salty end. Desserts are not the main focus at Maru, though there are still limited options if you have a sweet tooth like the Soya Bean Tofu (S$8) and Ice Cream (S$5 per scoop) with three different flavours – homemade coconut, yuzu or goma. Rants It’s challenging to deal with a fusion concept as it is easy for the restaurant to lose its focus and lose its character as well. Will I Return Again? If you are looking for a Japanese fusion restaurant and bar in Tanjong Pagar, Maru Dine & Bar is a decent option. There are some hits and misses in the dishes I tried, though the mix and choice of ingredients in some dishes like the truffle chawanmushi and white tuna tataki are interesting enough to leave an impression. Make your reservation instantly here here.